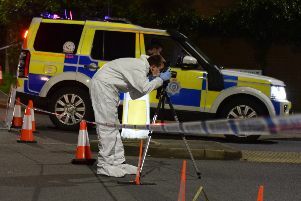 Police have issued more information about a hit and run in Eastbourne at the weekend. Officers say that at 3.30am on Saturday (November 10) a black BMW 325 car travelling east in Brassey Avenue, Hampden Park, collided with three parked cars - a blue Skoda Citigo, a red Nissan Almera and a silver Nissan Micra. The impact shunted the Almera into an adjacent garden wall. The driver of the BMW fled from the scene. No injuries were reported. Anyone with information about the crash or the driver involved is asked to contact police online at www.sussex.police.uk/rtcappealresponse) or call 101, quoting serial 195 of 10/11.